With the success of Springfield Armory’s SAINT™ AR-15 Pistol in 5.56, more people than ever are requesting variations to the original version. The newest iteration in .300 BLK harnesses the power of this combat-proven round for increased capability and versatility in a compact platform. The SAINT AR-15 Pistol features a rugged SB Tactical SBX-K forearm brace to reduce size, stabilize recoil, and enhance accuracy in one or two-hand shooting. A 9-inch CMV barrel with a 1:7 twist and A2 flash hider makes the SAINT Pistol small, fast, and ideal for CQB. The barrel is Melonite® treated inside and out to be as durable and more accurate than chrome lining. To ensure durability, the M16 BCG’s bolt is precision-machined from Carpenter 158 steel, shot peened, magnetic particle inspected and finished in super-hard Melonite®. 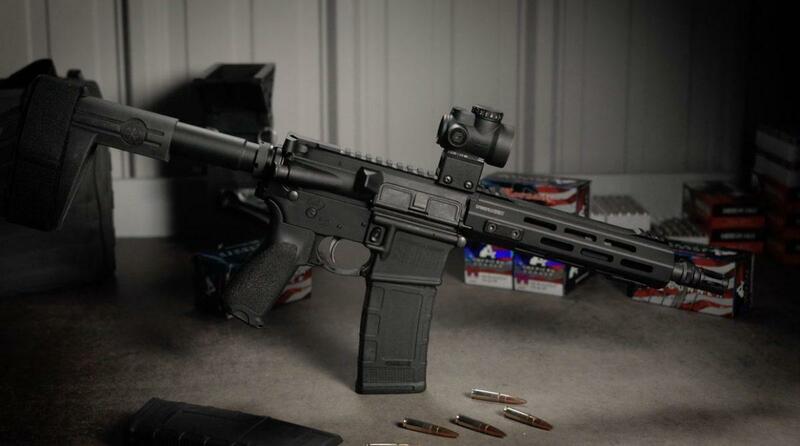 This combat-grade SAINT AR-15 Pistol carries a Magpul Gen M3, 30-round magazine. Visit for more information on the SAINT™ AR-15 Pistol .300 BLK.